At university the teapot reigned. Many a nice cup of Yorkshire tea saw me through the tranquil hours of essay composition and private study. Especially during Neighbours. But when those halcyon years were suddenly over, I discovered a time called 7am. And something stronger was called for. 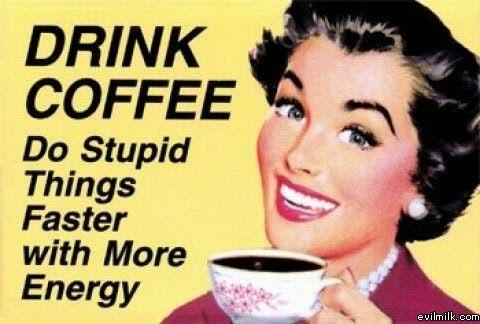 Coffee is my new best friend. While I can always turn to my old buddy Mr Tea Bag for a leisurely afternoon chat, coffee shakes me from my bed on my darkest days, props open my eyes and wrenches the foggy brain into focus; it moves my limbs in the required directions even when I’m in a daze. Watch the army of commuters staggering from house to office and you’ll see the same recurring movements everywhere, a set of well-practised actions which have become second nature by necessity as much as by repetition. Person A (let’s call her Coco [haha]) lurches from the tube station and takes her daily detour via Starbucks/Costa/Nero/Pret. 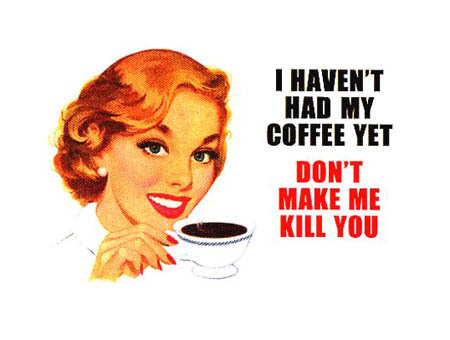 Barely raising her heavy-lidded eyes, she slurs a multi-syllabic string of cocoa-related words at the apathetic barista. ‘Grande-skinny-cappuccino-widanextrashot-and-hot-milk-plus-extra-foam-and-chocolate-sprinkles.’ Coco stands trancelike until the receptacle touches the counter, at which, sudden, wild action is triggered. The cup is lunged for, seized, propelled to mouth, scalding bitter liquid is desperately inhaled. And there! There it is: a reverberating sigh of relief, and her entire being visibly trembles as the dregs of fatigue are sent packing. She is not alone. This rite of morning passage takes place every day across cities all around the world. Millions of people haul gigantic cardboard cups from desk to mouth, from desk to mouth, from desk to mouth. Tongues are burnt, countless pennies are spent, all for a taste of that precious, gleaming, magical brown liquid with the power to shake us into instant action. I’m an Americano with milk girl. No sugar. The cheapest option, but also the most unadulterated, gearing me up for stacks of invoices, difficult authors, endless meetings. Eleven o’clock and it’s time for another. Shameful as it is to admit, I depend upon this little luxury. I like my tea, but I need my coffee.